Peel the eggs and chop into small pieces. Crumble the bacon into small pieces. Rinse lettuce and tear into bite-sized pieces. Rinse peas. In a small bowl, mix together mayonnaise, sour cream, milk, hot sauce, sugar, salt and black pepper. Whisk until smooth. Spread lettuce in a single layer on the bottom of a 9x13 inch baking dish. Layer bacon on top of the lettuce, reserving 2 tablespoons. Layer eggs on top of the bacon. Layer peas on top of the eggs. Pour mayonnaise mixture evenly over the salad. Layer Cheddar and mozzarella cheeses over the top of the dressing. Sprinkle the remaining 2 tablespoons of bacon over the top of the cheese. Cover with plastic wrap and refrigerate at least 2 hours before serving. Bring a large pot of water to boil over high heat. Add potatoes and boil for 5 minutes. Add carrots to the pot and boil potatoes and carrots for another 10 minutes. Turn off heat and add peas to the pot. Let sit in hot water for 3 minutes and then drain potatoes, carrots and peas. In a medium saucepan, melt butter over medium heat. Whisk in flour to make a paste. Gradually whisk in milk, stirring constantly until mixture thickens slightly. Season the milk mixture with salt, pepper and Thyme. Add potatoes, carrots and peas to the sauce and stir. Simmer for 5 minutes and pile into a serving bowl. Garnish the top with parsley and serve immediately. Melt butter in a saucepan over medium heat. Add the shallots and cook 2 minutes. Add garlic and saute another 2 minutes or until the shallots are translucent. Pour broth and water into the pan and stir well. Bring to a boil. Add peas and reduce heat to medium low. Cover and simmer for 10 minutes. Add the mint leaves and stir well. Pour the soup into a blender or food processor and puree in batches. Strain the soup back into the sauce pan. Add whipping cream, sour cream and season with salt and pepper. Pour into serving bowls and top with bacon pieces. Serve immediately. In a large skillet or wok, heat oil over medium heat. Add garlic, crushed red pepper and almonds. Saute for 2 minutes. Add chicken, carrots, bell pepper, mushrooms, snow peas and broccoli. Saute for 8 minutes or until chicken is cooked through. While chicken and vegetables are cooking, make the sauce. In a small bowl, combine brown sugar, soy sauce, Worcestershire sauce, vinegar, ginger, cayenne pepper and flour. Whisk together until smooth. When chicken is cooked, turn heat to high and pour sauce over the chicken and vegetable mixture. Let mixture come to a boil. It will thicken slightly. Toss chicken and vegetables to coat well with sauce and serve immediately. Add rice, water, salt, pepper and ginger to a saucepan. Bring to a boil. Reduce heat, cover and simmer for 20 minutes or until rice is cooked. Add water to a second saucepan. Boil carrots on high heat for 4 minutes. 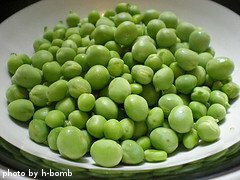 Remove from heat and add the peas to the hot water. Let sit 1 minute and drain. Heat oil over high heat in a wok or large skillet. Add garlic and saute 1 minute. Add peas and carrots and stir. Add eggs and stir again to scramble the eggs. Stir in shrimp and cooked rice. Turn off heat and continue stirring for 1 minute. Drizzle in soy sauce and sesame oil. Toss again to coat the rice, shrimp and vegetables. Serve immediately. In a large skillet, heat olive oil over medium heat. Add garlic and saute about 1 minute. Drop snap peas into the oil and saute about 5 minutes, or until slightly tender. 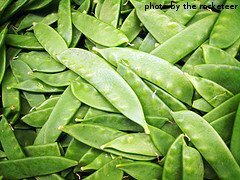 While snap peas are cooking, combine soy sauce, sesame oil, cayenne pepper, ginger, brown sugar and sesame seeds in a large bowl. Whisk until smooth. Pile cooked snap peas into the sauce bowl and toss well to coat them with the sauce. Serve immediately.